Hitachi Systems is expanding a network of sales offices and service sites around the globe to provide IT solutions optimized across geographic boundaries to a growing number of customers operating in the global arena. We provide end-to-end IT services ranging from developing and implementing IT infrastructures to operating them by leveraging talented human capital of group companies in Southeast Asia, India, and other parts of the world as well as a network of partners. We assist customers in expanding their business globally and implementing enterprise IT governance. We provide end-to-end global ICT support ranging from designing and implementing complete ICT systems, including international networks, to operating, monitoring, and maintaining them. We save customers operating globally the time and trouble of implementing an international ICT network that works across multiple languages and diverse business customs. We assist customers in reconstructing IT infrastructures in their offices, factories, and stores, from proposing and designing new ones to implementing and operating them. Our help desk handles inquiries from customers having problems with business systems and PCs in their overseas offices. When a customer has a system failure overseas, our engineers in Japan and in the country in which the customer operates work together to bring the system back to operation as quickly as possible. Our Japan-based system engineers and sales staffers work closely with their counterparts in other Hitachi Systems Group companies, joint-venture companies, and Hitachi Group companies in Southeast Asia, and India to assist customers in exercising IT controls over their overseas offices from Japan and in implementing and operating in their overseas offices an IT system initially developed in Japan. Hitachi Systems, Ltd. and Sunway Technology Sdn. Bhd., a leading IT solutions provider in Malaysia, established joint venture Hitachi Sunway Information Systems Sdn. Bhd. in Malaysia in 2013. 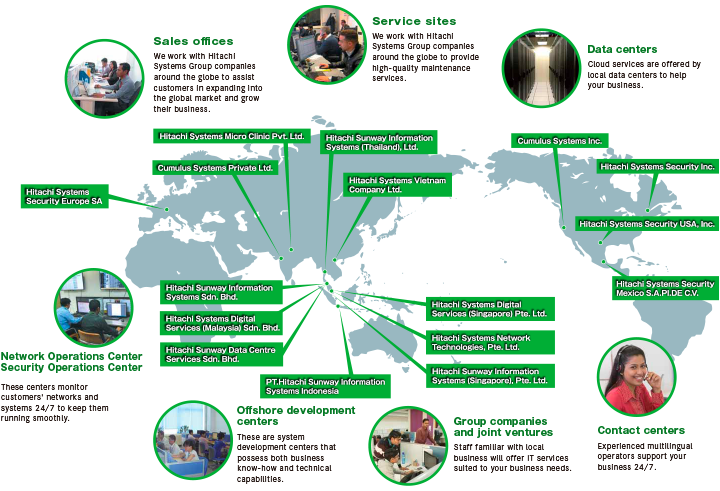 Hitachi Sunway Information Systems and other companies in its group provide customers in Singapore,Thailand, Indonesia, and Vietnam with business applications, engineering solutions, infrastructure services, data center solutions, and other ICT solutions that go beyond product services. Having joined the Hitachi Systems Group in 2014, this India-based company sells and maintains IT hardware, as well as provides solutions and support for system and network integration, IT security, virtualization, managed services, and desk-side assistance. Having joined the Hitachi Systems Group in 2014, this IT service company based in Singapore provides solutions for network installation, IT infrastructure construction, and various services tailored toward the medical and healthcare industries. Having joined the Hitachi Systems Group in 2012, this U.S.-based software company has an R&D facility in India. The company leverages its expertise in virtual IT infrastructures and technical prowess in software development to market performance-analyzing tools capable of managing virtual IT infrastructures and also provide analytics services. Having joined the Hitachi Systems Group in 2015, this Canada-based provider of global IT security services has security operations centers in Canada, the United States, Mexico, and Switzerland, which provide security services to companies and public institutions throughout the world. The company is known for its sophisticated security solutions, including monitoring services.